Holy Thursday arrived in Seville, Spain on March 29, 2018 with the traditional pomp and circumstance. 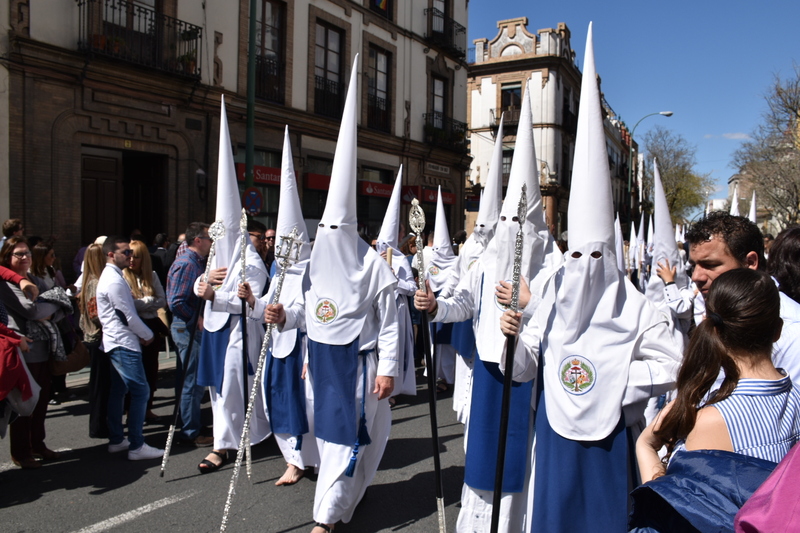 Donning capes and tall conical hoods (the capirotes), the nazarenos marched through the streets of the city to the central Cathedral as they have done for hundreds of years. But the hundreds of men in white hoods held a very different meaning for some people in the crowd. 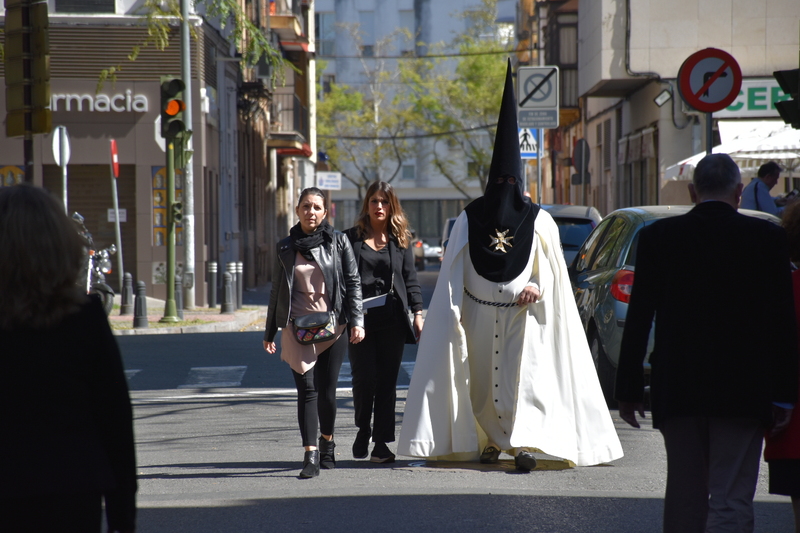 While the nazarenos may have focused on their penitence during holy week (Semana Santa in Spain), the scene meant something quite different to the lone American Jew watching the march. Americans have long associated people dressed in white robes and hoods as belonging to the Ku Klux Klan (KKK), a racist and anti-Semitic group that continues to have some support in parts of the country. The Southern Poverty Law Center considers the group to be both the most infamous and oldest hate group in the USA. The group epitomizes hatred and violence. As such, most Americans instinctively cringe when they hear about the group or see their members in the infamous hoods. It is hard not to have the same immediate reaction when seeing that attire in a very different situation. Jews cannot come to Spain and not consider how few Jews remain in the country. 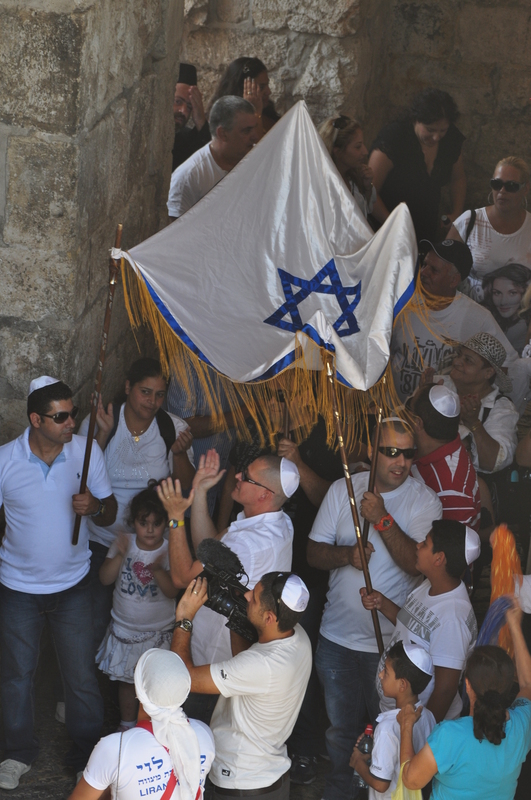 The expulsion of the Jews in the summer of 1492 is marked in collective memory, much like the Holocaust of 1939-1945. The cleansing of the Jews in Spain had an earlier start in Seville, as it was in that city that the Spanish Inquisition really got its start. In 1391, a preacher by the name of Don Fernando Martinez lectured his congregants that Jews were evil and were infiltrating Spanish society. 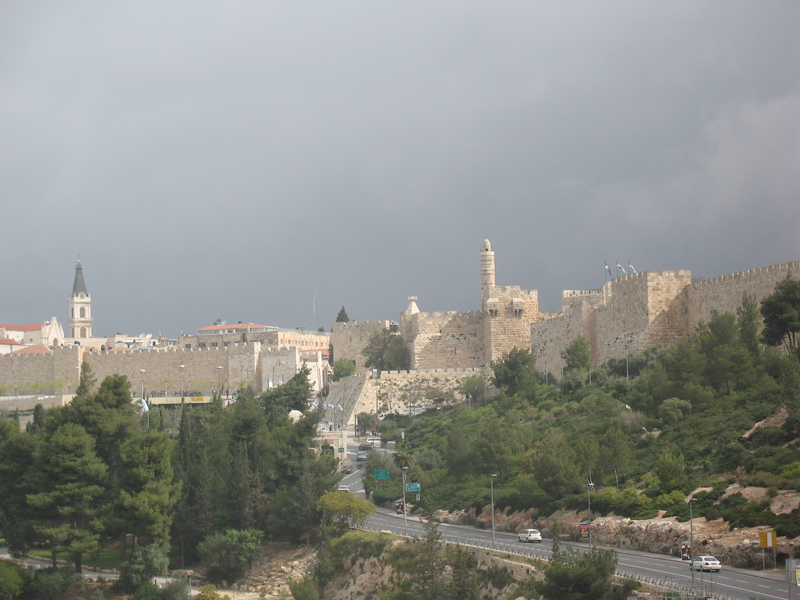 While the riots that broke out in March were put down, the mob gathered strength and plundered the Jewish Quarter of the city in June. Roughly 4,000 people were killed. The synagogues in the city were either destroyed or converted to churches and the Jewish community was decimated. Within two years, King Henry III of Castile (1379-1406) passed judgement on the preacher and the city itself for what had transpired. 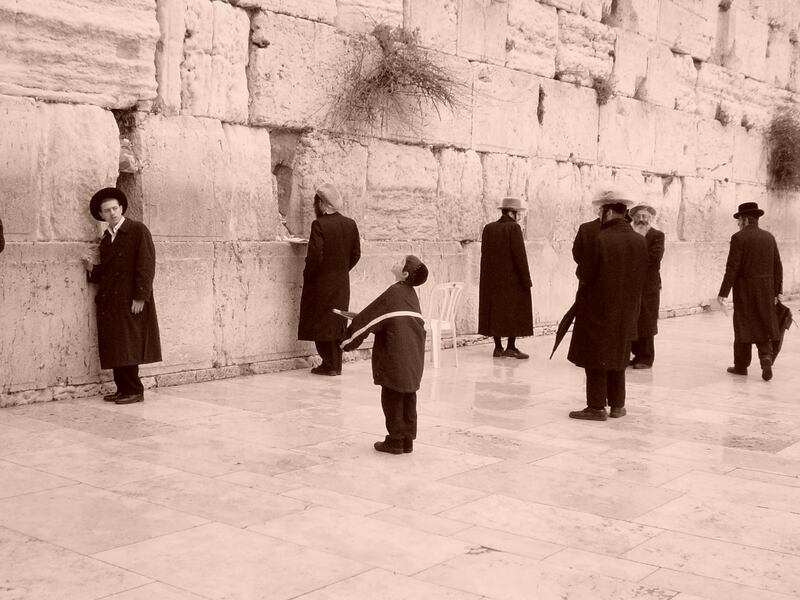 Few Jews returned and the city. That year, in 1393, the first brotherhood (hermanad) appeared called Las Negras. 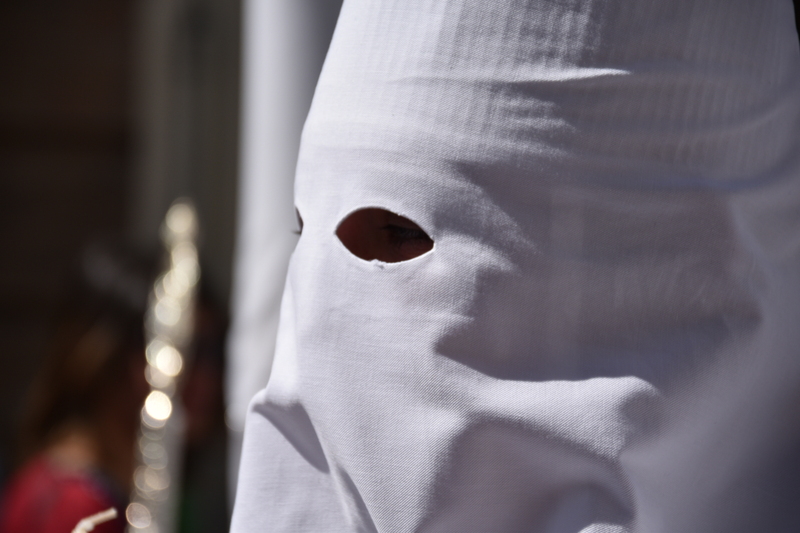 As a sign of penance during Semana Santa, the members donned white robes and capirotes, and have continued to do so until this day. In time, other brotherhoods would cover the city. They would wear their own colors of Black-and-white, all purple or green. Over holy week, they would carry large candles and march towards the cathedral, many handing out candies to the children who would normally be scared of such scene. There were no longer Jews in the city to care or remember. I have no doubt that the Catholics celebrating Holy Week in Seville have no idea that the origins of their processions stemmed from their massacre of Jews. I do not even think that they ponder why their region of Spain uniquely uses this custom. The area of southern Spain is known as Andalusia, and is the part of Spain that was under Muslim rule from the 700’s until the Catholics expelled them in 1248. In all, I believe that today’s Catholics’ desire to seek purity is self-reflecting, and does not consider that their ritual comes from evicting all other religions from the province. But this American Jew observes too many things. Like someone attending a funeral service at a cemetery who looks off in the distance to see cars go by without a care, I do not blame the Catholics for their indifference to my plight as they go about their own day. However, I cannot help see the ghosts of the Jews of Spain as I watch their procession during Semana Santa in Seville. On March 23, 2018, an 85-year old Holocaust survivor was found brutally murdered in her apartment in Paris, France. The French authorities have been loathe to call the attack anti-Semitism, and the New York Times has been similarly adamant in not mentioning that the killers were Muslim. 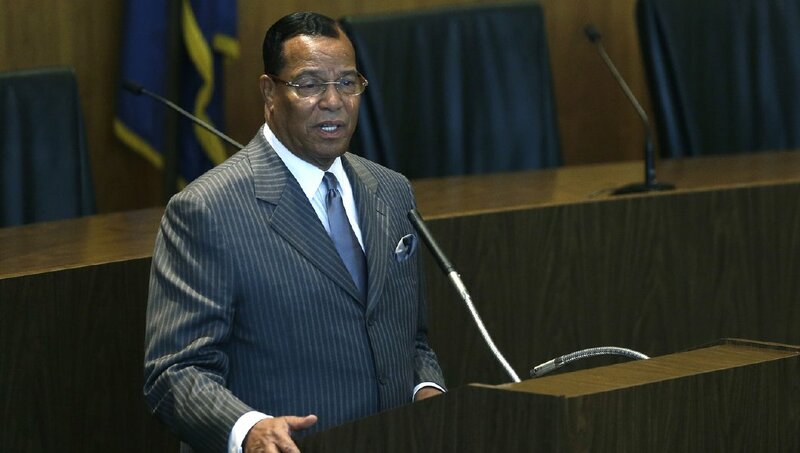 It was appropriate that the paper spelled out what the prosecutor’s failed to state clearly – that the victim was attacked because of anti-Semitism. It is therefore surprising that the paper would similarly fail to identify the attackers in this incident – and many others in France – as being Muslims. The Times wrote that the Paris prosecutor’s office said that the two men arrested for the murder were from “North African origin,” but failed to clarify that almost all of the men that moved to Paris from North Africa were Muslim. When the Times gave background about the murder of an elderly Jewish woman, Sarah Halami, last year in France, it would only write that the killer was “a man of Malian origin who shouted ‘God is Great’ before throwing her out a window.” Did the paper clarify that he was Muslim, that 95% of Mali is Muslim, or that he actually said “Allahu Akbar” in Arabic? No. When the Times wrote about the murder of four people in a Parisian kosher supermarket attack in 2015, it rightly called the attack antisemitic, but it only noted that the killer was “Amedy Coulibaly, a heavily armed Frenchman.” Did it mention that he was a pro-ISIS Islamic radical of Malian descent? No. When the Times described the “2012 assault on a Jewish school in Toulouse by Mohammed Merah, who killed three children and a teacher after killing three soldiers,” did it add that he was a Muslim of Algerian descent that pledged allegiance to al-Qaeda? No. 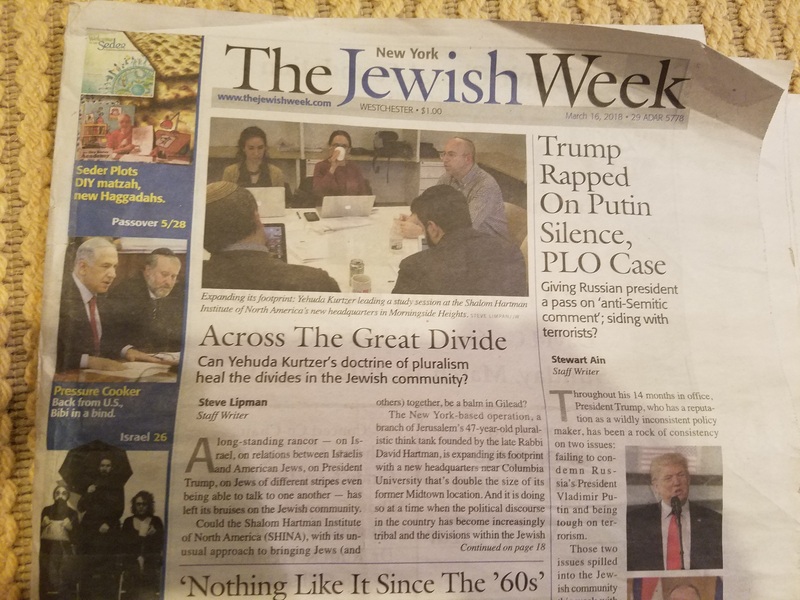 Did the Times give any color as to root cause of the murder of an elderly Jew? Well, it did – because of perceived Jewish actions. “The suspect ‘said that the Jews have the money, and that was the reason he attacked her,’ Mr. Kalifat said [who heads a French Jewish organization. ]” The problem was that Jews have the money. There was no mention of noxious Islamic Jew-hatred. This has become standard practice for the New York Times, to conceal the background of the attackers, especially if they are Muslim. The disparity continued for seven other opinions. Overall, the ADL concluded that 49% of Muslims in France are anti-Semites compared to 17% of French Christians and 14% of French atheists. The United Nations’ bias against Israel has a long disgraceful history. Whether the 1973 “Zionism is Racism” declaration or the disproportionate number of resolutions against Israel every year, the global body continues to unleash its anger at the Jewish State. Complementing the UN’s attacks on Israel is the elevated concern for Palestinians. Whether with unique agencies for the descendants of Palestinian internally-displaced people versus a separate agency for actual refugees from around the world, or other special agencies for these people without a country, the UN continues to show particular attention to this one group. And so it should perhaps come as no surprise that when the UN decided to hold a conference about the state of women in the world in March 2018 called ““Challenges and opportunities in achieving gender equality and the empowerment of rural women and girls,” that it should highlight the plight of a single group of women that suffer – Palestinians. This is no exaggeration. Countries from around the world assembled because of concern that “rural women continued to be discriminated against, marginalized and economically and socially disadvantaged; urged Governments to enact laws to ensure women’s land, property and inheritance rights; and called on stakeholders to address the digital divide that disproportionately affected rural women and girls.” But focusing on global issues facing women wasn’t enough. The UN thought that the situation of Palestinian women needed unique attention. A special session. Particular affirmation. For 17 pages the United Nations rehashed the Israeli-Palestinian conflict under the rubric that it was concerned about women. And the countries assembled for the task of addressing the plight of all women adopted the ridiculous inclusion of the Palestinian narrative, with a recorded vote of 30 in favor, 4 opposing (Canada, Guatemala, Israel and the UK) and 11 abstentions. Bret Stephens noted on March 23, 2018 that “the U.N. is a never-ending scandal disguised as an everlasting hope.” It proves it every day. In a March 8, 2018 article called “No Man’s Land: New U.S. Embassy in Jerusalem May Lie Partly Outside Israel,” the Times came up with a new term that was both meaningless and said much about how the liberal paper thinks of Jews living east of the 1949 Armistice Lines. That’s quite a phrase, “diplomatic settler.” It’s also completely nonsensical. U.S. ambassadors are U.S. citizens, not Israeli. How can an American be a settler? Simply by being Jewish? There was a time that a “settler” meant any Israeli that moved into a new development over the Green Line in Judea & Samaria / the West Bank. The physical new town was known as a “settlement” and the inhabitants were known as “settlers.” The homes defined the people. Over time, a pro-Palestinian narrative took hold in much of the world which inverted that formula. For them, the people (settlers) define the homes (settlements). Specifically, any Israeli Jew that lives over the invisible Green Line is known as a settler. (This is in sharp contrast to Israeli Muslims – like the thousands of Arabs in eastern Jerusalem that have taken Israeli citizenship – that are never considered “settlers.”) Presumably, the rationale for focusing on people is based on a very broad reading of Article 49 of the Fourth Geneva Convention that Israel’s policies enabling Jews to live in the land that it took from Jordan in 1967 is effectively a “transfer of population,” possibly runs counter to that international law. But The New York Times moved the definition of a settler yet again, in a giant anti-Semitic leap. For anti-Zionists like the New York Times, ANY Jew, regardless of citizenship should be considered a settler if they live east of the Green Line. Hence the U.S. ambassador to Israel would become a “diplomatic settler,” simply because he’s Jewish. If the U.S. Ambassador to Israel were Christian or Muslim or Buddhist or any other religion, presumably the diplomatic settler moniker wouldn’t stick. This new approach could lead to all sorts of interesting titles. What would happen if the United States decided to recognize a State of Palestine along the lines agreed to thus far between the principles, in Gaza and Area A of the West Bank, and established a U.S. embassy in Bethlehem. If that U.S. ambassador to Palestine was Jewish, I guess the Times would also label him a “Diplomatic Settler.” Only a non-Jewish diplomat could avoid having such title, and not be branded a colonialist interloper. It has long been clear that Palestinians are the most anti-Semitic people on the planet and that the leaders of the Palestinian Authority desire a new country free of any Israeli Jews. How refreshing to learn that the alt-left similarly endorses a completely Jew-free land. Even of American Jewish diplomats. 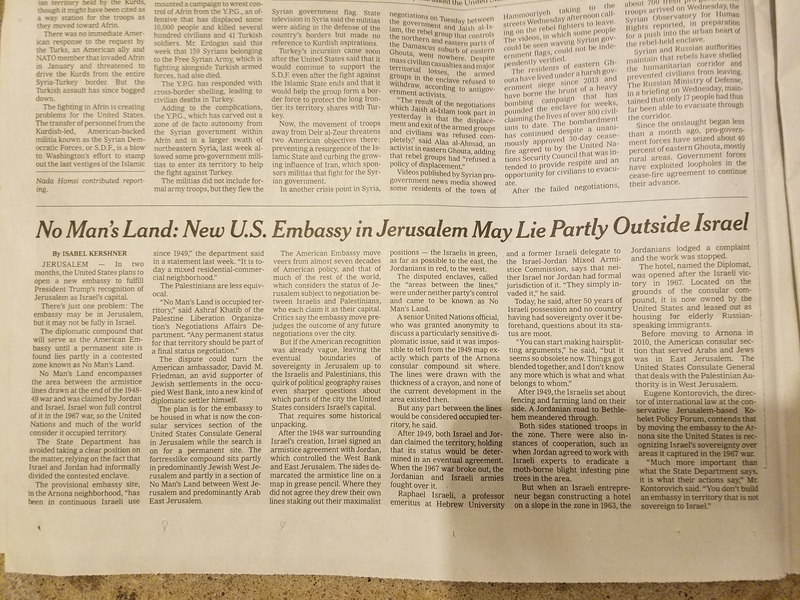 On March 8, 2018, Isabel Kershner wrote an article for the New York Times called “No Man’s Land: New U.S. Embassy in Jerusalem May Lie Partly Outside Israel.” The article described that the location of the U.S. embassy would partially lie outside of Israel’s 1949 Armistice Lines with Jordan in an area known at the time as the “No Man’s Land.” It attempted to explain the terminology through a history lesson about the area. But being the New York Times, the history would be incomplete and distorted. 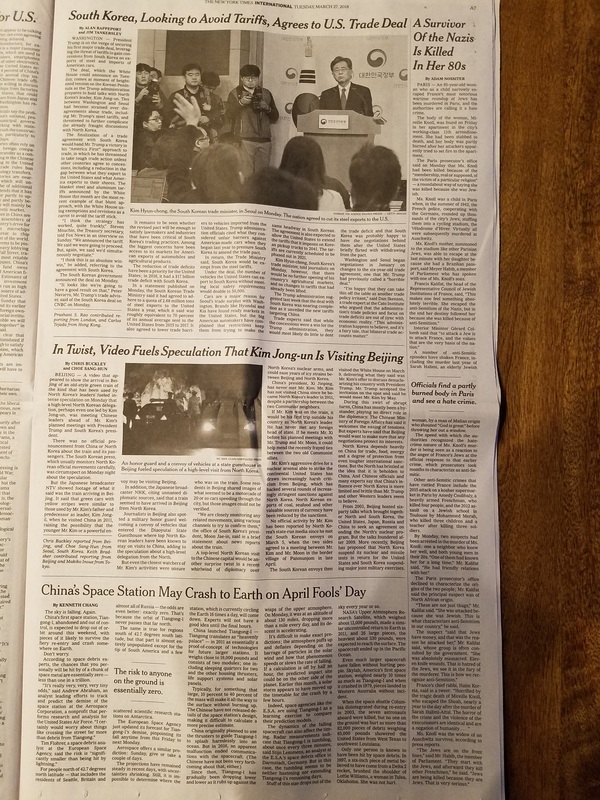 As the NY Times does at every occasion, it describes Israel’s administration of Judea and Samaria with a statement that the world does not recognize Israel’s claim and considers the land “occupied territory.” Yet the Times will never print – even here in an article meant to clarify the nature of the land – that Jordan’s claim on the entirety of the West Bank/Judea and Samaria was never considered valid. “After the 1948 war surrounding Israel’s creation, Israel signed an armistice agreement with Jordan, which controlled the West Bank and East Jerusalem. The sides demarcated the armistice line on a map in grease pencil. Where they did not agree they drew their own lines staking out maximalist positions – the Israelis in green, as far as possible to the east, the Jordanians in red, to the west. Note the many problems of the first sentence. It states that no party is to blame for the 1948 war. A person would never know that the armies of five Arab countries invaded Israel at its creation by the first half of the sentence. The second half would lead a reader to conclude that the Jordanians naturally had controlled the West Bank and East Jerusalem. This is deeply flawed. The Hashemite Kingdom of Transjordan, as today’s Jordan was known back in 1948, invaded and illegally annexed Judea and Samaria and the eastern half of Jerusalem. To state that Jordan simply “controlled the West Bank and East Jerusalem,” makes that illegal seizure seem normative and historic. It was neither. It was an invasion in an offensive war to destroy Israel. The article would also not mention anywhere that Israel formally annexed the entirety of the eastern portion of Jerusalem – including No Man’s Land – in 1980. How could any background on the area omit such a detail? Further, Jordan gave up any claim to the area in July 1988. How could the article neglect to mention that small tidbit? In short, the article focused squarely on Israel’s claim to a part of Jerusalem counter to a Jordanian claim that the paper wrote about as a historical reality. In truth, the Jordanians NEVER had an legal claim to any of the West Bank or eastern Jerusalem, and rescinded the false claim to that land 30 years ago. 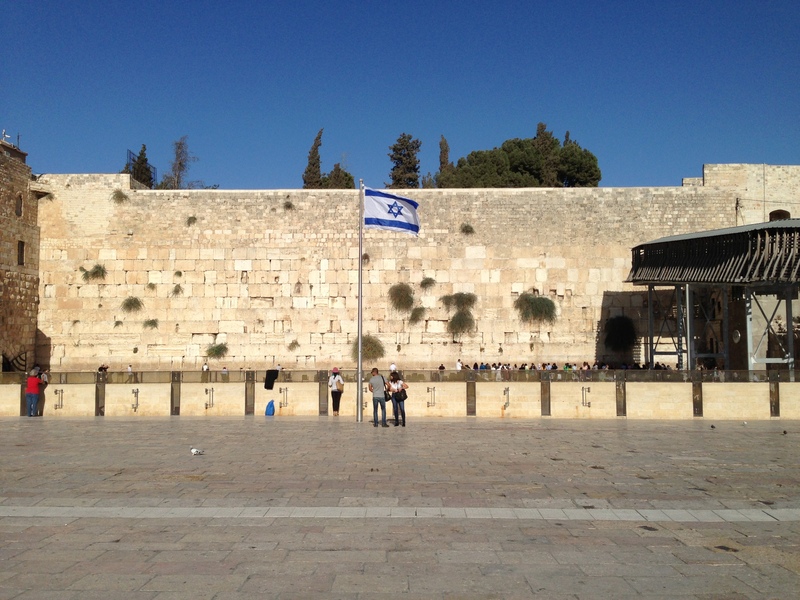 Jerusalem was divided for roughly 19 years of its 4000 year history, from 1948 to 1967. 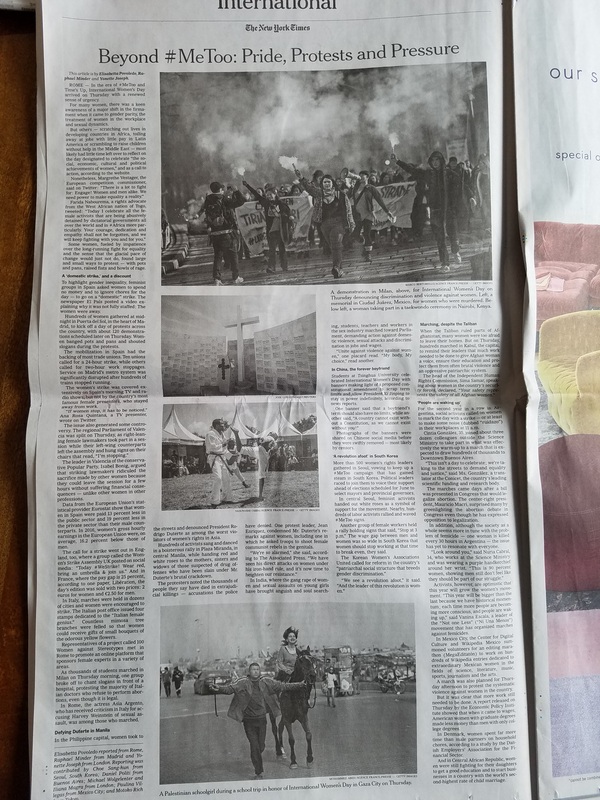 But the New York Times will continue to try to slice and divide Judaism’s holiest city at every opportunity to minimize the Jewish State’s ties to its capital.